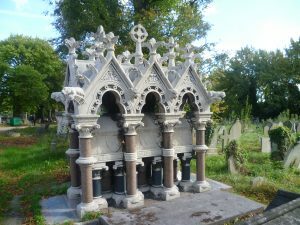 Kensal Green Cemetery is an extraordinary place with an astonishing variety of tombstones: Do you fancy ivy twining up crosses, you have it; angels dancing on the roof of a classical columned temple, you have that, too; there are severe Egyptian-style family vaults, as well as pointy Gothic shrines. Furthermore, it is gloriously egalitarian; royalty lies within a stone’s throw of self-made men, quack-doctors, artists, and incongruously modern gravestones with plastic flowers. The fifty-six acre cemetery opened in 1833 as the first of seven private London cemeteries providing a specially-designed space for burials away from the over-crowded, insanitary graves in the city churchyards. The new cemetery needed a really classy burial to seal its credentials and, in 1848, it got it. H.R.H. 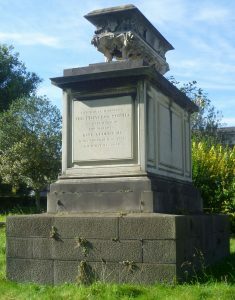 Princess Sophia, daughter of George III, was buried there in ‘a Quattrocento sarcophagus on a tall pedestal’ (Pevsner), and her brother, Augustus, Duke of Sussex is buried nearby. Naturally, a number of aristocratic families followed, as did a multitude of self-made men, anxious that their family vaults should fully display their prestige and their wealth. 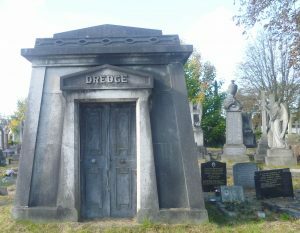 Some of the mausoleums are sober in design, like the severe Egyptian style chosen by businessman James Dredge (1840-1906). (His name does not encourage the fanciful.) It is a solidly constructed building which has stood up well to London weather; the roof, for example, allows rain to run off it easily. The same cannot always be said of other mausoleums in the cemetery. Other buyers of plots, however, launched into the Gothic style with reckless abandon. 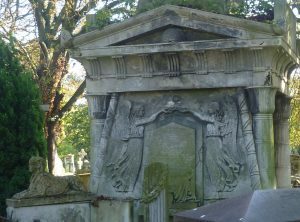 Take Charles Spencer Ricketts’ tomb of 1865 which architect historian, Nikolaus Pevsner, described disapprovingly as ‘an atrociously rich Gothic shrine with a canopy’. It’s way over the top but I can’t help thinking Ricketts probably enjoyed cocking a snook at his neighbours’ tombs. He was rich; he could afford it. Why shouldn’t he display his success? I rather liked this bulbous sarcophagus standing on what looks like hippopotamuses’ feet. I had a vision of it moving rather ponderously, one night when nobody was looking, and settling down somewhere else. 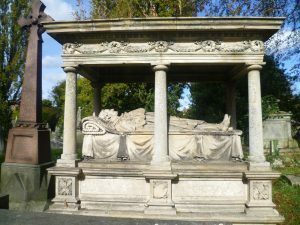 John St John Long’s elegant tomb is one of the early ones, dating from 1834. Pevsner describes it as ‘a chaste Ionic aedicule with four pediments’. Long himself was far from respectable; he was a very successful quack doctor. He added the Saint John – pronounced the aristocratic way, ‘Sinjon’, to give himself a bit of added class. In spite of twice being tried for manslaughter after the death of two patients, he was acquitted both times. He plainly believed in his own medicine because we can see the medical symbol, the caduceus with the snake twining round it to the left of the inscription. On the other hand, he was suspiciously young, only thirty-six, when he died. The above view shows the mixture of architectural styles. 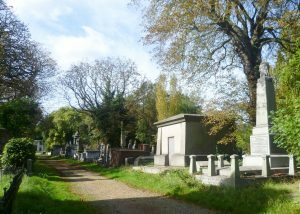 Pevsner felt that the visual attraction of the cemetery lay in ‘the leafiness of its avenues, and the pleasing decay of much of the architecture.’ You can see what he means, although nowadays, the Friends of Kensal Green cemetery, together with English Heritage, are busy assessing damage and repairing where they can. This is not an easy job as, before they can start, they need the permission of the owners, many of whom cannot now be traced. Andrew Ducrow (1793-1842) is one of the cemetery’s more flamboyant characters. In 1808 he was the chief equestrian at Astley’s – famous for standing astride two horses galloping side by side; he also performed at St George’s Circus, St George’s Fields, in 1815. Later, he produced ‘spectacles’ at Drury Lane Theatre. He was obviously successful financially because his mausoleum cost £3000, a staggering sum at a time when a working man would be lucky to earn £1 a week. Stylistically, it is eclectic, to say the least. There are sphinxes at each corner and the columns have Egyptian lotus capitals. But it sports a Greek pediment and a Roman broken pillar stands in front, to signify a life broken off. There are two angels (Christian, but wearing flowing Greek stolas) on each side of the inscription; they are holding a Greek laurel wreath between them as though honouring a winner at the Olympic games – perhaps in recognition of Ducrow’s equestrian skills. There is also a beehive carved inside the pediment which may stand for hard work, or death and rebirth. The painter, William Mulready, R.A. (1786-1863) designed himself what Pevsner calls ‘a charming Lombard Renaissance six poster with incised stories on the base’. The figure of Mulready himself wears suitably Renaissance artist’s clothes. Mulready designed the first penny-postage envelopes issued by Rowland Hill, inventor of the postage stamp (1840); before that, letters were just folded over with the address written on the back. 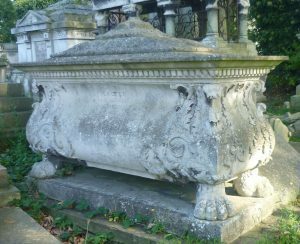 I admire his self-confidence; a hundred-and-fifty years on, we may not rate him as an artist as highly as he rated himself but at least he commissioned a top quality tomb designed by Godfrey Sykes, who decorated the Victoria & Albert Museum. 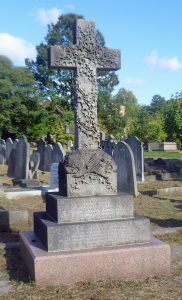 I rather like Fanny Anne Tompkins’ tomb with its riotous tendrils of ivy covering the entire cross, and a starfish-like fern growing over the plinth. There was a Fern Craze in the 1870s, and one feels that Fanny might have had a Wardian case in her parlour in which she grew maiden-hair ferns and parlour palms. Perhaps she even took part in the popular ‘Fern Hunts’ and collected her own. Quotations are from the architect historian Sir Nikolaus Pevsner’s London Vol. 2, 1952. Love this. Amazingly eclectic styles. Must be a hoot to visit as well as an education. Thanks for pointing the way. Thank you for your comment, Elizabeth. Some of the stories behind the ‘respectable’ owners of the tombs were beyond belief! Where there’s money, there’s a story, and many of them were gratifyingly disreputable! I do love a wander round a cemetery and this one looks as if it’ll be particularly rich in oddities. The last ‘big’ one I visited was in KolKota where interested locals had worked very hard to dig the monuments out of the undergrowth. So many sad tablets there as the Europeans tended to succumb at a young age. Thank you for your comment, Anne. It’s good to hear from you. Lucky you visiting the cemetery in Kolkota; it sounds fascinating. The relics of Empire can be very poignant. 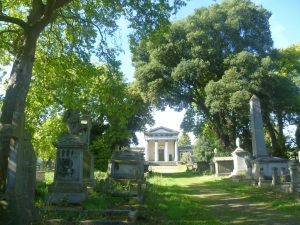 Kensal Green Cemetery is large, 56 acres, and we were only able to scratch the surface. I shall certainly revisit it and see what else is there. It was a wonderful visit and your photographs are so much better than mine. 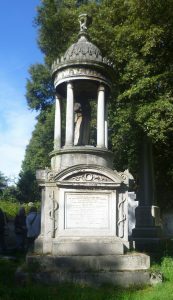 I particularly relished the Dickens connections with the grave of his much loved sister-in-law Georgina whose death at a young age so devastated him, and the tombs of his first biographer Forster and his protege Wilkie Collins. The latter’s grave was particularly well tended with plants and fresh cut flowers. You wonder who cares so much. An admirer of “The Moonstone” perhaps?